Infections of joint replacements can become a very serious problem. An infection can result in needing to remove the implanted joint. The most commonly performed joint replacements are knee replacements, hip replacements, and shoulder replacements. Much less commonly, other joints, such as elbows, wrists, and ankles, are being replaced. Bacteria are usually well controlled by our immune system. Once an infection is detected, our immune system rapidly responds and attacks the infecting bacteria. However, implanted materials, like those found in a joint replacement, can allow infections to persist. Our immune system is unable to attack bacteria that live on these implants, and these infections can become serious problems. If an infection of an implant goes untreated, the problem can worsen, and the bacteria can gain such a foothold that they can become a systemic problem. 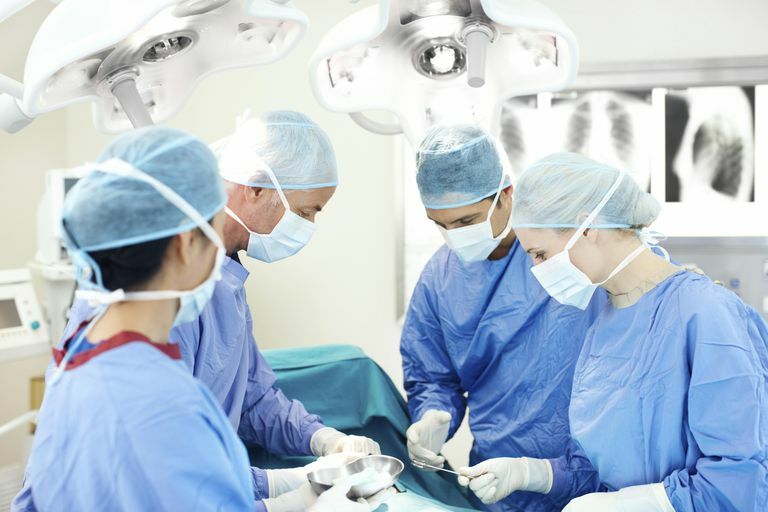 Antibiotics are given within one hour of the start of surgery (usually once in the operating room) and continued for a short period following the procedure. Different antibiotics may be used depending on factors including the patient's individual history of infection, allergies to specific medications, and other concerns. The dose may also be adjusted depending on the patient's weight. Efficiency in the operation by your surgeon helps to lower the risk of infection by limiting the time the joint is exposed. Limiting the number of operating room personnel entering and leaving the room is thought to decrease the risk of infection. Care is taken to ensure the operating site is sterile. Any reusable instruments have been sterilized in an autoclave and not exposed to any contamination. The implants are packaged to ensure their sterility. Disposable items are sterile and discarded after use. After the operation, the risk of developing an infection from an outside source is reduced, but there is still a risk of developing an infection from the bloodstream. Because of this, patients with a joint replacement implant should take antibiotics before invasive procedures such as dental work, colonoscopies, etc. It is known that these procedures may cause a transient risk of bacteria entering the bloodstream. Antibiotics will help control this and prevent joint infection. Infections have a tendency of adhering to the implant, and the implant itself is a hospitable location for infections. The way that our immune system fights infections, and the way that antibiotics are delivered to an area of infection, is both through our bodies blood supply. Artificial implants do not have a blood supply, and therefore joint replacements are a safe haven for infection. Even with aggressive antibiotic treatment and even surgical cleansing, curing an infection on a joint replacement is often impossible. Many times, the only way to cure an infection is to remove the entire implant, allow the infection to be treated, and then redo the joint replacement. Why Did I Get an Infection? Sometimes it is difficult to discern exactly why somebody gets an infection. Unfortunately, even with modern surgical techniques, they continue to occur. The chance of getting an infection after a joint replacement surgery is around 1-2%, slightly higher in people who have risk factors for developing infections. Infection after joint replacement surgery is among the most feared complications of this surgical procedure. While joint replacements are often successful, they can have serious risks. If an infection occurs after joint replacement, additional surgery is almost always required, and sometimes multiple surgical procedures. In many cases, long-term antibiotics are necessary, and removal of the implants may be necessary depending on the type and timing of infection. Prompt identification and treatment are keys to successful management of a joint replacement infection. Iorio R, Osmani FA. "Strategies to Prevent Periprosthetic Joint Infection After Total Knee Arthroplasty and Lessen the Risk of Readmission for the Patient" J Am Acad Orthop Surg. 2017 Feb;25 Suppl 1:S13-S16. Osmon DR. "Microbiology and Antimicrobial Challenges of Prosthetic Joint Infection" J Am Acad Orthop Surg. 2017 Feb;25 Suppl 1:S17-S19.